To come to Hollywood California and not to see the Hollywood Sign would be the greatest sin one could commit. Well, so would not seeing the Pacific Ocean. One way to get there is the Los Angeles public transport system or, the Metro. There are several public transport apps. Download your favorite one to help you plan your trip on the go. A single ride fare will cost you about 2 dollars. You can also grab a day or a week pass, just get a tap card via vending machines at the metro stations and you are ready to go. What’s more, the metro offers a bike sharing system with kiosks in metro stations and spread all over Downtown Los Angeles. You are welcome to take your bicycle along on the metro rail. Please make sure to stand in designated areas while riding the rail. With the growth of cycling culture, greater Los Angeles and Southern California has some new bike routes weaving through its veins. You can ride the scenic route along the Pacific Coast Highway, or through dense metropolises with designated bike paths like in Hollywood or in Downtown Los Angeles. After having walked all morning along Hollywood Boulevard and having taken in its eccentricity, head down to the closest metro station, grab a bike and take the red line. The red line will take you from Hollywood Boulevard through Thai Town, touching the outskirts of Little Armenia on to Korea Town and finally to the Financial District of Downtown LA. This is where you change lines. It is the Expo line that will take you all the way to Downtown Santa Monica. Head down through the streets of Santa Monica towards the beach. Santa Monica has a twenty six mile bike path. This bike path will allow you access to cafes, restaurants and a beautiful ride along the Pacific Coast. Feel the cool breeze in your hair, the hot sun on your skin and the taste of saltwater on your lips as you glide along the coast. Yes, life's truly beautiful. 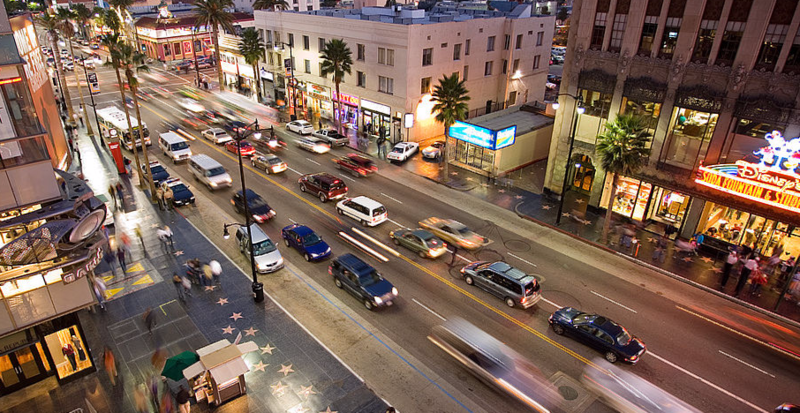 One of the best ways to get around in Hollywood and greater Los Angeles is by car. There are several ways of doing this. Once you’ve safely landed and passed through passport control, picked up your luggage and exited the building to be greeted with the damp, slightly industrial air of Los Angeles International Airport, you may take a regular taxi to your Hollywood destination. However, this will set you back a little over $100. A cheaper alternative is to take Uber, the most common taxi service. Download the app and try it for yourself. A ride from LAX to Hollywood will cost you somewhere from $30 to $100 plus, depending on the type of car you request. If you’re not one to wait around to be picked up, then you are welcome to make use of the many car rentals at LAX. You can rent your car online and pick it up when you arrive. A small car with insurance and unlimited mileage will cost you about $300 per week. Don’t forget to have appropriate documentation and licensing for driving in the United States. If you haven’t booked your travel accommodation yet, make sure to check our Hollywood and Los Angeles apartels, featuring fully furnished apartments, conveniently located close to your travel destination. Travel safely and enjoy your trip!